Link: https://mail.google.com/mail/u/0/?tab=rm#inbox/FMfcgxwCgCVxdNFVDWwNkFFlB bQkQrQb Please see link above for original text, embedded hotlinks and comments. 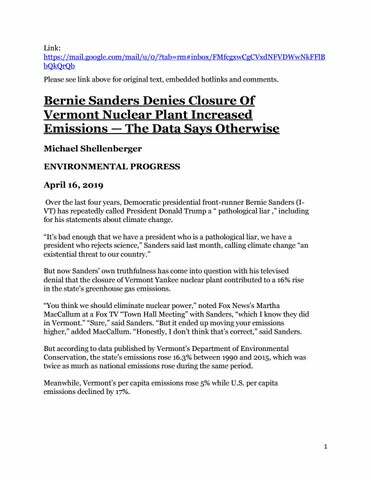 Bernie Sanders Denies Closure Of Vermont Nuclear Plant Increased Emissions — The Data Says Otherwise Michael Shellenberger ENVIRONMENTAL PROGRESS April 16, 2019 Over the last four years, Democratic presidential front-runner Bernie Sanders (IVT) has repeatedly called President Donald Trump a “ pathological liar ,” including for his statements about climate change. “It’s bad enough that we have a president who is a pathological liar, we have a president who rejects science,” Sanders said last month, calling climate change “an existential threat to our country.” But now Sanders’ own truthfulness has come into question with his televised denial that the closure of Vermont Yankee nuclear plant contributed to a 16% rise in the state’s greenhouse gas emissions. “You think we should eliminate nuclear power,” noted Fox News’s Martha MacCallum at a Fox TV “Town Hall Meeting” with Sanders, “which I know they did in Vermont.” “Sure,” said Sanders. “But it ended up moving your emissions higher,” added MacCallum. “Honestly, I don’t think that’s correct,” said Sanders. But according to data published by Vermont’s Department of Environmental Conservation, the state’s emissions rose 16.3% between 1990 and 2015, which was twice as much as national emissions rose during the same period. Meanwhile, Vermont’s per capita emissions rose 5% while U.S. per capita emissions declined by 17%. In March, The Boston Globe editorial board criticized Sanders for urging that Vermont Yankee nuclear plant to be closed. 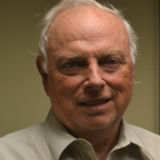 “Bernie Sanders, noted the paper, “wanted the plant on the Connecticut River gone.” “The consequence,” wrote the Globe, “was an increase in greenhouse gas emissions from New England, and a hole in the region’s energy grid that will haunt it for decades.” On Fox TV, Sanders confirmed that he wants to “phase out” America’s nuclear power plants, which provide 60 percent of America’s low-emissions electricity. In 2018, US emissions rose 3.4%. Sanders made a second statement contradicted by energy data. “In my city, Burlington, Vermont, the largest city in the state of Vermont, all of our energy is now renewable,” said Sanders. Sanders appears to be referring to the fact that Burlington burns biomass for a significant portion of its electricity. But according to the US Environmental Protection Agency, biomass power plants produce one-third more carbon emissions than coal plants. In 2017, Burlington’s McNeil biomass plant burned 398,000 tons of wood, which is about 10 tons of wood per resident of Burlington. McNeil biomass (wood) electric generating plant in Vermont supported by Bernie Sanders. How much energy does it take to harvest these forests, strip the branches off the trunks, dispose of the branches, transport the trunks to the generating plant, turn them into sawdust? Even more ridiculous, the alarmists in Europe and the USA are promoting shipping American forests to the UK to be used in biomass electric generating plants there. In 2018, nearly 800 scientists asked the European Union to stop subsidizing biomass because it involves destroying biodiverse forests. Burlington’s JC McNeil biomass plant produced 139 tons of nitrous oxide in 2017, according to the US Energy Information Administration, a greenhouse gas. Nitrous oxide can, according to the US EPA, “aggravate respiratory diseases, particularly asthma, leading to...hospital admissions and visits to emergency rooms.” And electricity is just a fraction of Burlington’s energy consumption, much of which comes from burning natural gas for cooking and heating and petroleum for transportation. Sanders, as a U.S. senator, represents the whole of Vermont, not just Burlington, whose residents constitute less than 7% of the state’s total population. And Vermont’s emissions from burning petroleum in transportation increased significantly from 2005 to 2015. Vermont shows that renewables cannot make up for the loss of nuclear. The only wind farm, Deerfield, to be built in Vermont over the last decade took eight years to be completed due to litigation related to the siting of the farm in black bear habitat. It would take 59 wind farms the size of Deerfield to replace the annual quantity of electricity from Vermont Yankee, which was one of the smallest nuclear plants in the U.S. when it was closed. If Vermont were continuing to build wind farms at the same pace it built Deerfield, which it isnâ&#x20AC;&#x2122;t, it would take until the year 2491 to replace the electricity that was once produced by Vermont Yankee.